Finding runes, especially higher level runes, is an obsession for many players. This can be a chore, since there's no way to use equipment to increase your odds of finding more runes, or higher level runes. Magic Find has no effect on rune drops, either quality or quantity; the way to find runes is to kill lots of monsters in larger games, so more total items drop. Refer to the giant Rune Finder Guide by Urlik for much more detail and information about how and where best to find runes. Rune hunting is somewhat simplified by the fact that Magic Find is of no benefit (or penalty) to rune finding. So a character truly out to find runes can suit up in all his/her best killing gear, without giving a thought to Magic Find. This isn't highly recommended, since magic find improves the odds of finding Unique and Set items that are useful or that can be traded (for runes, perhaps), but purely from a rune hunting point of view, magic find is useless, and worse than useless if using the MF equipment slows a character's overall killing speed. Since the goal of most players is to find higher quality runes, the hunting is best done on the highest level monsters that your character can safely and quickly kill. As with magic finding, a balance between killing speed and monster level must be found. Struggling to kill very high level monster because they have a .000001% better chance of dropping a Cham, is not a wise expenditure of time or energy. Since rune finding is largely a crap shoot, it's best to kill quickly where your character is most capable of killing quickly. Levels with a lot of monsters are best, simply to increase the total item drops. Places like the Secret Cow Level, the Flayer Jungle, or the surface areas of Act One (with their teeming Fallen camps) are popular killing zones due to the high density of fairly weak monsters. The only monster in the game with a substantially higher % chance to drop runes in The Countess, found on level five of the Forgotten Tower in the Black Marsh level of Act One. Since v1.09 she's had excellent odds to drop at least one rune every time, and in v1.10 her odds were increased still higher. She can not drop the highest runes in the game, but hoping to see any runes above 24 or 25 (see rune list for further info) drop is a fool's game. They do fall from time to time, but the odds are lottery-winning low. Better odds are to find lots of runes in the teens and low twenties, and to cube them up, as well as trading other item finds for mid-to-high level runes, and cubing those up as well. A few monster types have higher odds of dropping runes because they can not drop armor or weapons, and thus spit out more runes since they have fewer other possible drops. These include Wraiths, Finger Mages, Vulture Demons, Willowisps, and the Swarm. These monsters are worth harvesting while rune hunting, but they spawn infrequently and in underwhelming numbers, so few players will find it worth the effort for the slight increase in the odds of finding runes. Three quests grant runes as part of their reward. This quest does not have a Rune as part of its reward (just a bunch of gold and minor items from a magical chest), but since v1.09 The Countess, a SuperUnique Corrupt Rogue you must kill to accomplish the quest, has begun dropping a rune almost every time she's killed. Her rune drops were increased still further in v1.10, and she's now a very popular target for item running characters. Which runes she can drop vary by difficulty level. Normal: El (r01) - Ral (r08). Nightmare: El (r01) - Io/Ko (r18); above Io (r16) is much rarer. Hell: El (r01) - Ist/Lo (r28); above Ist (r26) is much rarer. The Countess has better odds to drop a higher level rune the first time a player kills her on Nightmare or Hell difficulties, when they get credit for completing the quest. This is reflected in the different odds for Io/Ko and Ist/Lo listed above. Her odds of dropping her highest possible runes are always astronomical, but they are slightly better the first time than the other times. She is capable of dropping up to six runes each death, and will often drop two or three. They're very unlikely to be higher than Tir or Eth, but reports of two Hels, and a couple of other mid-level runes are not uncommon, so it's possible. Normal: El (r01) - Amn (r11). Nightmare: Sol (r12) - Um (r22). Hell: Hel (r15) - Gul (r25). Unlike the runes from The Countess, or any other monster drops in the game, the lower level runes are not more common. The odds for Hel or Gul are identical on Hell, 1/11 for each. Cross your fingers. Be sure to complete this quest when you can get your rune drop, and do not finish it with other players in your party, if they have not finished the quest already. Four gems drop for every character completing the quest, whether they're near the Hellforge or not, but only one rune will drop for the quest completion, whether one or eight characters are in the party/completing the quest. This second quest in Act Five is easily accomplished, and your character will receive a Tal (r07), a Ral (r08), and an Ort (r09) rune as a reward for completing it. Not a huge reward, but for players who save all their runes to upgrade, every one helps. Chests (this includes barrels, crates, hidden stashes, etc) are an excellent source of items, including runes. See the super quests discussion in the Rune Finder Guide by Urlik for more details. More players in the game increase the quantity of items found from [chest]s, by decreasing the odds that the game will select the "NoDrop" option. This must be balanced with your overall killing time; taking 3x longer to kill monsters for 2x the drops is not a winning strategy. The level that chests drop at is determined by the area of the game they're found on; consult the Levels section for that information. The level of runes that can be found from chests progresses steadily as you move through the game. The following list details the highest level runes you can find in any area. All of the lower level runes may also be found there, and in fact are far more likely to appear than the higher level ones. Prior to v1.10, it was hit or miss obtaining runes above Ort, since only the first nine runes could be upgraded in the Horadric Cube. This changed in v1.10, when rune upgrade recipes were added that could turn Els into a Zod. 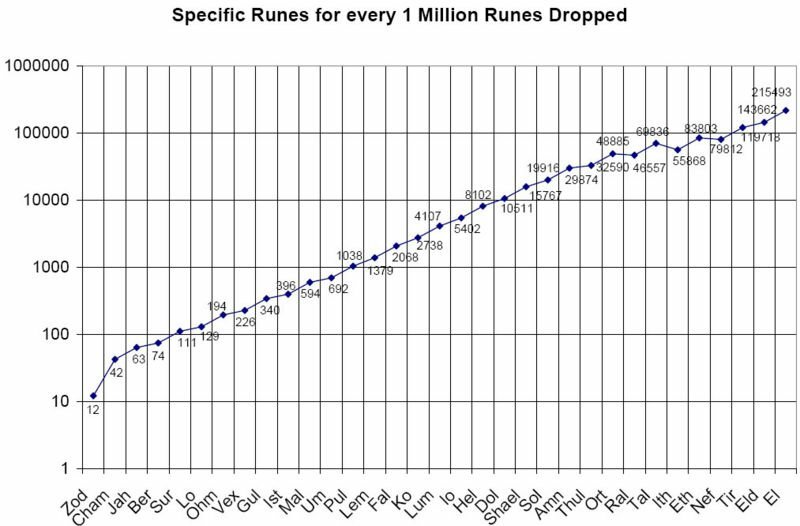 That would take over 14 trillion Els, but it's now possible to upgrade to all levels of runes, which means collecting them and building toward the high level runes required by the biggest Runewords is now a possibility for all patient players. Mathematically speaking, expecting to save and transmute the lowest runes into the highest ones is virtually impossible. It would take exactly 3,486,784,401 El runes to make a Pul rune, which is one of the first highly tradable runes, and to create your own Zod from El runes you would need 14,281,868,906,496 El runes and 1,088,393,215 assorted gems. If you are looking to make some of the highest runes you are simply wasting your time collecting any of the lower runes. Lower runes can be helpful for other purposes though, and are used in various cube and crafting recipes. 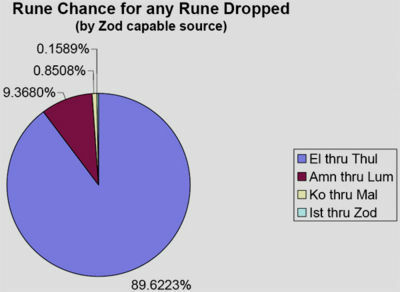 A pair of charts taken from Urlik's Rune Finder Guide illustrating the scarcity of higher level runes. These odds are accurate or v1.10+, and are based on the drop coming from a monster or object that could theoretically drop a Zod rune. This page was last edited on 18 November 2011, at 12:43.